It's my goal to offer intermediate-advanced workshops especially (but not just) for modern quilters, so I'm thrilled to announce my newest workshop for quilt guilds and workshops, the Waterfall Quilt. There are ENDLESS opportunities for these techniques, and I hope you'll join me! Read on! This class explores several essential intermediate-expert techniques for both improvisational and curved piecing. You'll learn how to sew my favorite improvisational blocks set in negative space. Finally, you'll practice bias curve piecing to give your quilt distinctive movement. These diverse skills are transferable and valuable – let me help you create a truly unique and modern quilt! 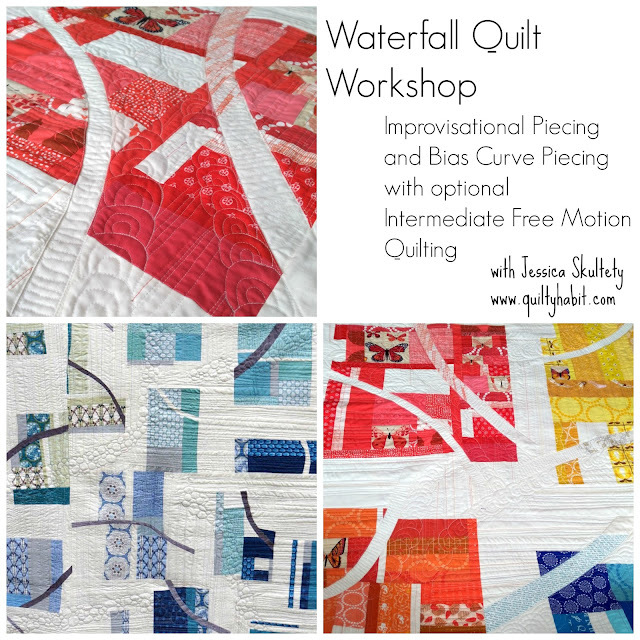 Optional: Turn the second half of class into an intermediate free motion quilting workshop. Learn how to quilt designs shown above and tips and tricks for quilting modern improvisational quilts. Please note that the improvisation part of the class will be shortened significantly to allow for this. If you want to read more about my classes and lectures, see below. Feel free to use my Contact form to inquire, or email me directly at quiltyhabit(at)gmail(dot)com. Let's go make some modern quilts!! These are 2 of my very favorite quilts you've made! I'd be the first one to sign up for your workshop, but alas, I'm on the west coast and the commute is just too much. Everyone who gets to join you in class will be truly blessed by your can do attitude, fun spirit and innovative techniques. This looks like fun! Love your quilts!